Chia seeds are a very popular, energy rich food originating from Central and South America. They are very nutritious and make a great addition to a healthy diet. They are rich in omega 3, full of fibre and help you to feel full helping curb your appetite. Chia seeds are reasonably high in protein – making them a useful source of plant protein, providing a wide range of amino acids, particularly for vegan and vegetarian diets. The combination of fibre, protein and fat means chia seeds are digested at a slower rate, which provides a prolonged, slow release of energy to maintain stable blood-sugar levels over a longer period of time. Chia seeds are also rich in minerals such as magnesium and calcium and trace elements such as manganese, which helps make enzymes. 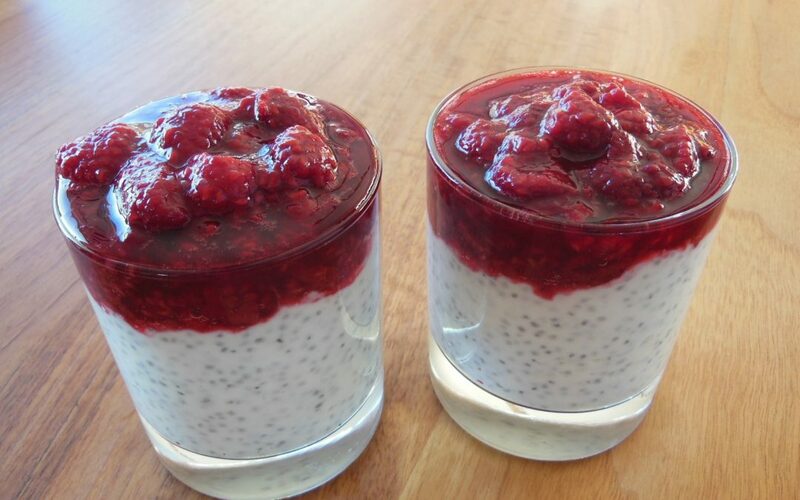 Chia seed pudding is a healthy and tasty dish which is great for breakfast, brunch, lunch or dinner or as a healthy snack any time of day. You can serve it with dairy milk or a dairy free nut milk and add some fresh fruit on top to add extra flavour. Chia seeds are rich in omega 3 and fibre so they make a great addition to a healthy, balanced diet. Chia seeds are great served with granola as well as in smoothies and salads. This recipe is really quick to make and stores well in the fridge. Fresh fruit, coconut flakes, cacao nibs, chopped pecan nuts, sultanas…..
A handful of fresh blueberries, raspberries and half a banana added just before serving also works really well.